For the first time ever, Raw Thrills and Namco have joined forces to create Pac-Man Chomp Mania, a ticket redemption arcade machine. This new 1080p HD video redemption piece brings back the classic Pac-Man game concept and combines it with the excitement and fun of winning tickets. Players win tickets by munching on as many of the familiar pac-dots and fruits as they can while being chased by the ghosts; Inky, Blinky, Pinky, and Clyde. Grabbing the Power Pellets and eating the "frightened" blue ghosts will earn players extra points. If the level is cleared, the player advances to a bonus stage where Pac-Man needs to evade the ghosts as he navigates through the maze and tries to enter the ghost chamber where the "PAC-POT" is located. If you are successful in entering the ghost chamber, the player wins the "PAC-POT" and is treated to a mesmerizing Pac-Man animation and cabinet LED light show! The gameplay has also been specially tailored to please both Pac-Man veterans and young novices alike. The balanced game play and iconic license of Pac-Man pulls from a wide demographic of customers and is sure to get both children and parents playing. The cabinet for "Pac-Man Chomp Mania" is beautifully lit from top to bottom with multi-colored LEDs as well as a spectacular overhead LED marquee. The overhead LED marquee is dynamic and vibrantly displays player score, in-game messages, and fun Pac-Man animations that occur in real-time during gameplay. 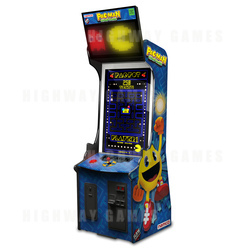 The game's cabinet design is a homage to the original look and feel of the classic Pac-Man cabinet with a modern twist. The entire cabinet package will stand out on any game room floor.